Select any task list out of all task-lists from left corner of your screen. Click on the menu icon from right and choose Copy email-in address. Select the address and copy it to use wherever required. First of all, paste the email-in address into recipient field in your email. Now, there are two email formats that can be used for adding tasks using email-in feature. Enter task details in any of these formats into the body of email and send it. Your task will be added under the task list. 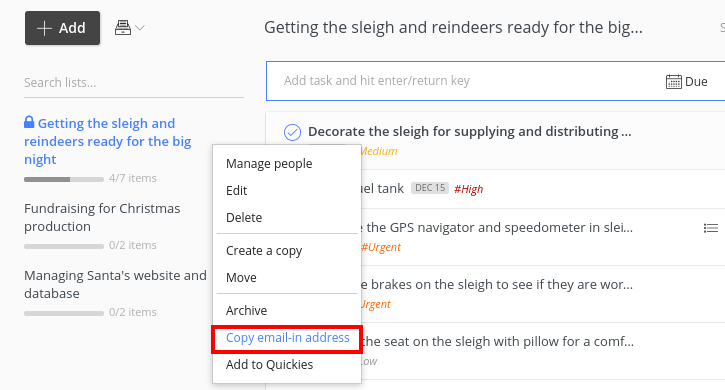 Task name is mandatory, whereas you can skip rest of the details to add tasks using email-in. While adding the start and end date, you will have to keep date format in mind. If your account has date format like: mm/dd/yyyy, then you need to write the dates according to this format. 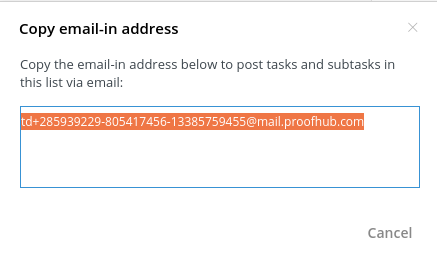 Please keep in mind to use the same email address for adding tasks that has been registered in ProofHub. To add comment without logging-in, reply to e-mail notification of comment on the task that you’ve received. The comment will be added in the thread.